Helen Winkler is also proprietor of the Jewish Dance website. The best online Jewish bibliographies are at the Jewish Music Web Center, www.jmwc.org. For further information on my findings e-mail me. If you wish to find a hard copy of the original books, the Jewish Genealogy web site has a searchable listing of which libraries have which books. There are also project coordinators for each book who can be reached via e-mail. Addresses are available on the individual web sites. I should add that this very worthwhile work is financed by donations and staffed by volunteers! In addition, bound copies of yizkor books can be purchased from The National Yiddish Book Center. Email Catherine Madsen. Scanned copies of Yizkor books can be found on the New York Public Library's web site. The Jews of My Generation by Jacob David Berg -Scroll down to read about the local klezmorim including Jankiel Kurdelas who's life was spared when he played his fiddle for his brutal Cossack would-be executioner. See also this section which details the weddings at which this band played, (Near the bottom of the page). "Reuniting of the Family in America" briefly describes the continuation of Yiddish dance traditions in a family that has emigrated to the USA. "The Jesters" describes the role and talents of badkhns in Dzialoszyce. "Jewish Artisans in Gombin, Section 11. Musicians (Kleizmerim)" Read about the bohemian musicians of the shtetl of Gombin. Sections: R' Anszel Szpilman"—a virtuoso on the violin and Josef Rajzler (Josele Badchan), a genius at his profession, "that was a force! That was an artist! The actors of today don't even reach his ankles." Scroll down to read about Reb Nishe der Klezmer the Lechovicher "Paganini." Read about noteworthy musicians from Orgeyev, including Melech (King) of all Musicians, who met his end when the jealous daughter of a wealthy landowner put poison in his cup and Petru the Gypsy musician who composed his own Jewish melodies. This essay was written by writer, Ruwen Brajnin who visited Będzin and Sosnowiec in 1908 to research the lifestyle of the poor. It describes the extreme poverty of a musician and his family. The Dubossar Klezmer—The section above about Yiddish theatre also looks interesting. Edited by: Ch. Wolnerman, A. Burstin, M.S. Geshuri. The Hasidic Dance in Oswiecim—A very moving account of a group of young Hasids who attempted to die observing the mitzvah of Kiddush Hashem, utilizing music and dance as a form of rebellion in Auschwitz. Chortkov a musical city—A detailed discussion of cantors, choirs, rabbis and musical life in Chortkov. A translation of: Sefer Zikaron le-kehilat Iwie; Edited by M. Kaganovich, Published in Tel Aviv, 1968. 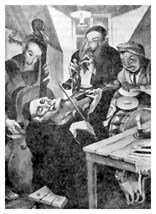 Section F: Leyzshinke the Tailor and His Gramophone (1910-1911) Read about the first gramophone in the shtetl of Iwie. The Talmud Society—A musical celebration that took place to mark the completion of the 7 year cycle of reading the Torah. Translation of Sefer zikaron le-kehilot Szczuczyn Wasiliszki Ostryna Nowy-Dwor Rozanka, Edited by: L. Losh, Published in Tel Aviv, 1966. Vasilishki portion of Shchuchin Yizkor Book: Musicians of Vasilishok, (4th sub-section from the bottom of the page) An account of the cobbler-klezmorim of Vasilishok. Scroll down to the section called Musicians for an account of R' Berele Shpilman's klezmer band. Read about singer/songwriter Matia in the shtetl and later in America. Scroll down to paragraph 12 to read about Bumek Strauss and the Sabbath Tango. Be sure to read the song lyrics at the end of the section. Scroll down this page to find the lyrics of some interesting folk songs. Translation of: "Mlawa ha-yehudit; koroteha, hitpatKhuta, kilyona" - "Di yidishe Mlawe; geshikte, oyfshtand , unkum"
Scroll down to read about the 'Jewish Gypsy tribe' of Mlawa. The following web pages discuss weddings in shtetls and often give information about the kapelyes that played at these weddings. The customs surrounding weddings are also often described. This philological work was originally published in the periodical publication, "Jewish Philology"—bi-monthly pages of linguistics, literary research and ethnography, under the editorship of Max Weinreich, Noakh Prilucki and Zalman Reizen. Volume 1, 1249, Publisher "Culture League," Warsaw. Gives many customs and details that are not mentioned elsewhere. Klezmer frequently referred to. Ann Helman describes wedding celebrations in this town including some mention of dance. You can read or listen to her description. DUBNO (P) Dubno Sefer Zikaron (Dubno; A Memorial to the Jewish Community of Dubno, Wolyn*). Detailed translation by Yale Strom that outlines numerous dances and some detail as to how they were done, and much information about the klezmorim. 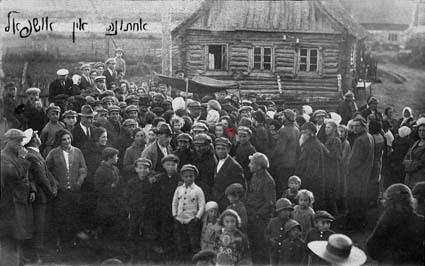 A wedding in Ushpol (Uzpaliai) description includes a photo of a shtetl gathered for a wedding. Note to klezmorim—in this shtetl the muscians jumped and danced while playing instruments and escorting the bride and groom to the khupe. Q. Jewish Weddings describes weddings in the area and the role of the musicians, many of whom moved to the USA and continued to work in music. Written by: Isidor Kasten, Translated by: Irene Newhouse. Though not specifically about music these chapters explain the difficulties and problems that families faced when trying to arrange marriages of their children. Social factors did affect the way weddings were celebrated. Common People describes the wedding of Reynele, the only daughter of Leyzer-Yosa, the presser, which unfortunately ended with the groom disappearing with the ring a few weeks after the ceremony. A Wedding on the Cemetery By Zev Sabatowski is one of many yizkor book entries that describe weddings held in a cemetary to ward off an epidemic. Read about weddings in Rzeszow where Fishbein's (a dance teacher) group played tunes of Polonaise, Quadrille, Waltz, and Polka, for the more modern crowd. A detailed discussion that includes dance and music information. Scroll down to read about the wedding celebration of a well to do family in Turobin, near Lublin Poland. Read this very detailed account of a wedding in Yedinitz which includes information about the bulgarish. Translation of: "Mlawa ha-yehudit; koroteha, hitpat Khuta, kilyona" - "Di yidishe Mlawe; geshikte, oyfshtand , unkum"
Read about Mendl Gurni and his kapelye who played at weddings in Mlawa. Scroll down to section II, paragraph 3, to read about Reb Yoshke's klezmer band and weddings in Hlusk. A detailed discussion from betrothal to khupe. Scroll down to the section about "Reb Yisroel Leyzer Weintraub of blessed memory," a badkhn known far and wide for his skill. Scroll down to paragraph 10 to read about the court of the Hasidic Rabbi of Sadagura and weddings held in the court. Further down is a discussion of the Zimbler (translates to cimbalom) family and their musical careers. Scroll down to Reincarnations of a Samovar (p.64) to read about a wedding with emphasis on the badkhn's role. Click on Celebrations and Holidays to read the section called "Wedding Celebrations". Translation of Sefer zikaron le-kehilot Szczuczyn Wasiliszki Ostryna Nowy-Dwor Rozanka, Edited by: L. Losh, Published in Tel Aviv, 1966. Vasilishki portion of Shchuchin Yizkor Book, A Wedding in the Shtetl (4th section from top). "Notes written by R. Moshe Kobriner to words of a song called Yah Ekhsof [I desire G-d] composed by the great Rebbe Aharon of Karlin. The words were written by R. Baruch, the Kobriner Rebbe, and edited by Moshe Nathanson. From the book, Horodetz ". The New York Public Library has two scanned images of the sheet music for the Drohichyn Yizkor book, including "Nigun from Der Shochet and one titled Ya Ekhsof from the ritual slaughterer. Yizkor Book: Arim ve-imahot be-yisrael; matsevet kodesh le-kehilot yisrael she-nehrevu bi-yedei aritsim u-tmeim be-milhemet ha-olam ha-aharona, vol. 5, Stanislawow (Towns and mother-cities in Israel: memorial of the Jewish communities which perished: vol. 5, Stanislawow), Ed: D. Sadan, M. Gelerter, Jerusalem, The Rav Kuk Institute, 1952 (Hebrew). "V'hi sheh-amda" (Song for the Passover Seder) Music for Karliner Pesach song. Click on the gif of the yizkor book for a closer view of the Song sheet for the Sabbath melody She-Hashalom Shelo [Peace that is His], sung by R. Binyamin Moshe the ritual slaughterer of the shtibel. This music is difficult to read. Copyright © 2001-2009 Helen Winkler. All rights reserved. This page is maintained by Ari Davidow. E-mail Ari Davidow with any comments or suggestions. Last revised18 January, 2009 .